The Wonderful Wizard of Oz – BANNED! 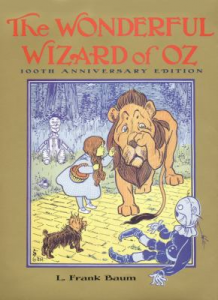 Originally published in 1900, L. Frank Baum’s children’s book The Wonderful Wizard of Oz (frequently reprinted as simply The Wizard of Oz) has been translated into many languages and reprinted numerous times in the 115 years since it first hit the shelves. Adapted into a Broadway musical, a classic film, and a cartoon, Baum’s unique story of a girl from Kansas visiting a far away land has inspired countless remakes, spinoffs, interpretations, and spoofs of every variety. While The Wizard of Oz may be a cherished part of American culture, it hasn’t always been celebrated. In fact, in 1928 the Chicago Public Library banned the book. The Detroit Public Library followed suit in the 1950s, also banning The Wizard of Oz, while Florida’s State Librarian added the title to a list of books Florida libraries were advised to not purchase or circulate. Libraries of the past were not the only groups opposed to the Wizard of Oz – in 1986, a number of fundamentalist Christian families in Tennessee filed a lawsuit objecting to the book being included in a public school’s syllabus. Reasons for The Wonderful Wizard of Oz‘s bans have run the gamut. From general claims that the book contains no value for readers to concerns that animals were given human characteristics to complaints regarding a strong female main character, it seems that many issues with the story have upset a variety of readers. One of the most interesting arguments against the Wizard of Oz claims that the inclusion of a good witch is theologically impossible, because witchcraft is bad and, therefore, a good witch could not exist. Culver, Stuart. “What Manikins Want: The Wonderful Wizard of Oz and The Art of Decorating Dry Goods Windows.” Representations 21 (1988): 97-116. Field, Hana. “Years of Censoring Oz.” Chicago Tribune 8 May 2000. Starret, Vincent. “L. Frank Baum’s Books Alive.” Chicago Tribune 12 May 1957. ← The Canterbury Tales – BANNED!